Also, Firebird Suite; Scherzo a la Russe; Tango. 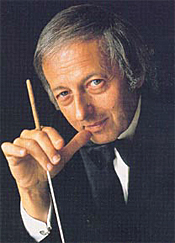 Ivan Fischer, Budapest Festival Orchestra. Channel Classics CCS SA 32112. When Igor Stravinsky (1882-1971) premiered his ballet The Rite of Spring in Paris in 1913, the audience pretty much rioted. Regular theatergoers used to elegant, refined dance music had no idea what Stravinsky was up to with his primitive, often fierce rhythms describing some kind of ancient fertility rite. The composer didn't subtitle it "Pictures from Pagan Russia" for nothing. The score's pounding beat also helped shape the path of subsequent twentieth-century music, making Stravinsky not only controversial but genuinely revolutionary. In these times, we accept The Rite as an established classic, but, obviously, it wasn't always so. Which brings up the subject of how to approach it today; certainly, it still needs a good deal of fire and passion in its presentation, such as the renditions we've heard from Sir Georg Solti and the Chicago Symphony (Decca) or Leonard Bernstein and the New York Philharmonic (Sony). 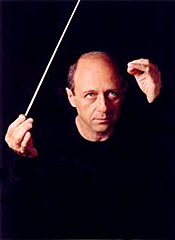 Maestro Ivan Fischer and his Budapest Festival Orchestra, though? Not so much so on this present disc. In the Rite's "First Part: Adoration of the Earth," Fischer handles the lyrical portions of the score splendidly, delicately and airily, with plenty of atmosphere. But he seldom seems to let loose as one might expect, despite a fairly quick pace throughout. It's not that the performance lacks energy; it has energy to spare. It's just that Fischer's interpretation seems a touch static at times, providing fewer thrills than it might. The conductor has more success with the "Second Part: The Sacrifice," where he seems to be getting more in touch with Stravinsky's intensions. Here, Fischer combines his exceptional lyricism with the composer's intense desire to conjure up a full breakthrough of spring after a frozen Russian winter. Thank the tympanist, too, for his efforts in this regard. Nevertheless, the aforementioned Solti and Bernstein recordings, along with others from Boulez (Sony), Muti (EMI), and Stravinsky himself (Sony) have already provided us with plenty of beauty and excitement in the work; as a result, it's hard for Fischer's account to compete easily. Where the current disc does excel is with the accompanying pieces. The 1919 suite of seven movements from The Firebird comes off especially well, very mysterious, moody, and exotic. The Scherzo a la Russe and Tango show us an older, lighter, more-playful Stravinsky, music in which Fischer appears to take particular delight. This is a recording that the folks at Channel Classics seem to have meant as an audiophile demonstration piece, but it's also one that a person might have to own an SACD multichannel playback system to appreciate fully. The engineers recorded the performances at the Palace of Arts, Budapest, in 2010, and the two-channel stereo sound to which I listened on this hybrid disc is wonderfully cohesive, with a lifelike sense of stage depth and a wide stereo spread. Overall transparency, though, is only average, with a slight veiling of the midrange; a faint, thick blurring of detail; and a good deal of ambient hall resonance. Bass response, too, could be a bit stronger as well as dynamic impact, at least in the "First Part" of the Rite. By the "Second Part," however, the dynamics kick in a little better. It's a realistic sound, to be sure, if a tad distant unless played relatively loudly, in which case the music becomes a tad rough. So, on the one hand we get natural, potent sonics and on the other hand we get a somewhat heavy, clouded showing. I have no doubt that in its multichannel format the sound should come up even better than what I heard. Also, Cantique de Jean Racine, Elegie, Pavane, Super flumina Babylonis. 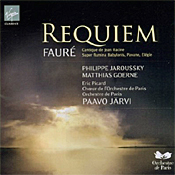 Philippe Jaroussky, countertenor; Matthias Goerne, baritone; Paavo Jarvi, Choir and Orchestre de Paris. Virgin Classics 50999 070921 2. Another Requiem? The public seems to love Requiems, which, considering they're masses for the dead, may seem a little odd until you recognize that the best musical settings for the Roman Catholic Requiem Mass are among the greatest music created. No, I'm not just talking about Mozart's or Berlioz's or Brahms's or Verdi's famous Requiems, which are somewhat dark, solemn, and heavy as befitting the occasion, but Faure's Requiem, which in comparison seems almost like a fairy tale. It's always fascinating to hear a new recording, a new interpretation, of it, like this one from Maestro Paavo Jarvi and the Choir and Orchestre de Paris. Gabriel Faure (1845-1924) remarked of his work, "It has been said that my Requiem does not express the fear of death, and someone has called it a lullaby of death. But it is thus that I see death: as a happy deliverance, an aspiration toward happiness above, rather than as a painful experience. My Requiem was composed...for pleasure." For this reason, Faure's Requiem has become one of the most celebrated settings of the mass, perhaps almost as famous as those mentioned above. Anyway, after initially writing the Messe de Requiem in D minor for soprano, baritone, mixed choir, organ, and orchestra, Op. 48, in 1888 using a chamber orchestra and small choir, Faure, at the urging of his publisher, had second thoughts and revamped it in 1898-1900 for full orchestra. He apparently was happy with that arrangement for the rest of his days. So that's the way folks played it until the 1980's, when British composer, conductor, editor, arranger, and all-around musicologist John Rutter found Faure's original manuscript for chamber orchestra, which Rutter himself and several other conductors have played and recorded. Still, it's the lineup for full orchestra and chorus that most people probably know best, and that's the one Jarvi and his forces perform here. Using the traditional arrangement of the work, Jarvi takes a fairly straightforward approach to the score, never rushing anything, and in the process sounding a tad old-fashioned, which I count an entirely good thing. He does bring out some intense dynamic contrasts, though, the choir sometimes falling into such a quiet hush, it will tempt you to turn up the volume. Resist. Baritone Matthias Goerne has a voice like rich honey, a voice that flows over the listener in golden tones. In the soprano part, we hear countertenor Philippe Jaroussky, who does a beautifully commendable job. Faure meant for his Requiem to be placid and loving, and in this regard Jarvi and company succeed nicely. "It is as gentle as I am myself," the composer once commented. Maybe it's this quality of gentleness that has sold it to audiences over the years, and certainly it's the quality Jarvi exploits to the fullest. The Requiem concludes in a glow of fairy dust, and this magical ending Jarvi also accomplishes successfully. It's a lovely production all the way around. Because the Requiem is brief, a little over half an hour, the disc offers the four short choral couplings noted above. These come off well, too, with the Pavane especially light and airy. Virgin recorded the performances live at the Salle Pleyel, Paris, in 2011. The sound is fairly close up on the orchestra, with the choir slightly recessed. There is adequate detailing, although it is a tad thick and soft overall, with a big left-to-right stereo spread and abundant ambient bloom without too much reverberation. While the orchestral sound is also a touch one-dimensional, perhaps because of the close miking, it is, fortunately, not at all hard or edgy. Finally, I'm happy to report that the Virgin producer and engineers spared us any applause, so the disc maintains to the end the meditative mood of the music. Cameron Carpenter is among the roster of presenters that will make TED2012 a summit of the great thinkers and revolutionaries of the world. He joins conductor Michael Tilson Thomas and banjoist Abigail Washburn, energy theorist T. Boone Pickens, choreographer Twyla Tharp and other leading intellectuals at the annual conference in Long Beach, California February 27-March 2. TED has reinvigorated spoken word by the viral spread of the talks online and the explosion of their ideas and events around the world. At TED2012, they "plan to celebrate this phenomenon and nudge it a further step forward." In a gesture that gives muscle to such a statement TED will temporarily install a major digital organ, modified to Cameron's specifications, in the Long Beach Performing Arts Center for his use during the conference. Cameron is well known on the conference circuit, having been a featured speaker and performer at The Entertainment Gathering in Monterey (EG '08 and '09), and most recently IdeaCity '10 in Toronto. TED is a nonprofit devoted to Ideas Worth Spreading. It began in 1984 with the purpose of bringing together people from three worlds: Technology, Entertainment, and Design. Since then its scope has become ever broader. Along with two annual conferences -- the TED Conference in Long Beach and Palm Springs each spring, and the TEDGlobal conference in Edinburgh UK each summer -- TED includes the award-winning TEDTalks video site, the Open Translation Project and TED Conversations, the inspiring TED Fellows and TEDx programs, and the annual TED Prize. TED talks are watched by millions of people worldwide and reach a massive audience daily, a fact sure to contribute to Cameron's continuing ascent as the organist to watch. Press Preview available – see Track List at end of release. American Composers Orchestra (ACO) announces the February 14 release of its second digital download album, Emerging Composers Series: Vol. 1. Following the March 2011 release of the orchestra's inaugural digital album (Playing It UNsafe), this new album features world premiere recordings of music by rising-star composers performed between 2006 and 2009 as part of Orchestra Underground, ACO's cutting-edge orchestral series at Carnegie Hall's Zankel Hall. By making available never-before-recorded orchestral music, ACO goes beyond the concert hall, reaching new listeners and gaining greater exposure and visibility for the young composers it showcases in this series. ACO will release two additional digital albums this spring – an album of new works for extended instruments with the orchestra, and an album of multimedia works. Emerging Composers Series: Vol. 1 includes music by Kati Agócs, Michael Gatonska, Fang Man, Clint Needham, and Gregory Spears. Gregory Spears's Finishing was first developed as part of ACO's Readings and Lab at University of Pennsylvania in 2007 – a sublime work that uses dog whistles (which are audible) and tape recorders within the orchestra. Kati Agócs deftly strings together a series of exquisite, intimate sonorities in her ACO-commissioned Pearls. Clint Needham's Chamber Symphony explores themes of personal and universal transformation; the composition was the result of his winning ACO's prestigious Underwood commission. Fang Man, also an alumna of the Underwood program, combines clarinet soloist (ACO's own Creative Advisor, virtuoso clarinetist Derek Bermel) and electronic techniques (performed by the composer and Alexis Baskind) with melodies from Chinese opera in Resurrection. Michael Gatonska, another Underwood commissionee, uses the ever-shifting configurations of birds in flight as the organizing principal behind his After the Wings of Migratory Birds, creating music that migrates through space with dynamic energy. Four of the five works on this album are ACO commissions. Creating opportunities for emerging composers is central to the mission of American Composers Orchestra, which seeks to be the leading research and development laboratory for American composers, orchestras and the wider cultural community. All too often it is the case that up-and-coming composers are excluded from professional orchestra programs, as better-known music is programmed. Yet, writing for orchestra remains one of the supreme challenges and rewards for most composers. The instrumental possibilities, the timbral nuances, the dynamic range, and the raw energy of dozens of talented instrumentalists unified in their musical execution is still, even in the 21st century, a singular and powerful sound experience. It is what has drawn these fine young composers to the orchestra, and it is the opportunity to see and hear what these composers might do with these possibilities that has drawn ACO to them. For twenty consecutive years the orchestra has offered New Music Readings (first as the Whitaker New Music Readings, and now as the Underwood Readings) that have become one of this country's most coveted opportunities for emerging composers. Readings give emerging composers the opportunity to work with an orchestra singular in its commitment to the development of the American composer, and to hear their work performed by some of the country's most outstanding contemporary music instrumentalists. Composers also benefit from critical feedback and mentoring from conductor, players, and senior composers. ACO has brought its New Music Readings to composers around the country through touring and residency programs, and its national network, EarShot, that assists and advises other orchestras in mounting their own Readings. ACO commissions a lot of new music, well over 200 works to date, much of it from young composers – often their very first professional commission. The Music Institute of Chicago's Four Score Festival, which annually highlights contemporary music, this year features Charles Ives March 4 and Aaron Copland March 11. In addition, the festival spotlights the winner of its Generation Next Young Composer's Competition and other young composers in a free performance March 9. All performances take place at Nichols Concert Hall, 1490 Chicago Avenue, Evanston. By incorporating popular forms of American music such as jazz and folk into their compositions, Aaron Copland and Charles Ives created innovative compositions with a sound that became synonymous with the landscape. Four Score Festival 2012 celebrates the music of these 20th century masters and explores how their inspiration threads through the works of two of their students: the March 4 performance focuses on the music of Ives and Gunther Schuller; the March 11 performance features the music of Copland and Mario Davidovsky. Performers on the programs include the Senior Chamber Orchestra of the Music Institute's prestigious Academy for gifted pre-college musicians, as well as members of the Music Institute's faculty and staff. On March 9, a free concert showcases the winner of the Music Institute's Generation Next Young Composer's Competition, which encourages and promotes the development of young composers. The program also will feature works from the Music Institute's Composer's Lab Program, created by Composer-in-Residence Mischa Zupko, and performances by young composers from the studio of Chicago-based composer Dr. Stacy Garrop. The Music Institute again has partnered with 98.7 WFMT to record the performance for future broadcast on the popular radio program Introductions, which celebrates talented pre-college classical musicians. In February 2012, violinist Vladimir Spivakov and pianist Olga Kern will embark on a rare joint recital tour in the United States, visiting top concert halls in Boston, New York City, Chicago, Seattle and San Francisco. This is the powerful duo's first ever joint recital tour outside of Europe, and they have created a dynamic program of works by Brahms, Stravinsky, Pärt, Franck and Schnittke. At the Carnegie Hall concert only, Spivakov and Kern will be joined by celebrated cellist and 2012 Musical America Artist of the Year, David Finkel of the Emerson String Quartet for a special performance of Shostakovich's Piano Trio No. 2. (complete repertoire list below). Throughout his career, spanning nearly four decades, violinist Vladimir Spivakov has been praised by critics for his deep insight into composers' intentions, the richness and beauty of his tone, his fine phrasing and nuance, his emotional impact on his audiences, and his refined artistry and intelligence. Mr. Spivakov made his United States recital debut in 1975 and international engagements quickly followed. He has performed as soloist with the most important orchestras in the world, and collaborated with some of the 20th century's most eminent conductors, including Svetlanov, Kondrashin, Temirkanov, Rostropovich, Bernstein, Leinsdorf, Ozawa, Maazel, Giulini, Masur, Chailly, Conlon and Abbado. In addition to performing major traditional works, Mr. Spivakov has continually treated his audiences to new and innovative repertoire, both in chamber music and orchestral works. Mr. Spivakov plays a violin by Stradivari. Spivakov is equally renowned as Conductor and Founder of the Moscow Virtuosi and as Founder, Artistic Director and Principal Conductor of the National Philharmonic of Russia. Olga Kern is the striking young Russian Gold Medal winner of the 2001 Van Cliburn International Piano Competition. Her performance of the Rachmaninoff Piano Concerto No. 3 made her the first woman to achieve this distinction in over 30 years. Kern made her New York debut at Carnegie's Zankel Hall in May, 2004, and eleven days later returned to New York to play again, this time on the stage of the Isaac Stern Auditorium at the invitation of Carnegie Hall. Ms. Kern is a magnetic performer with one of the most prodigious piano techniques of any young pianist. Last season, the Dallas Symphony Orchestra and Van Cliburn Foundation honored Ms. Kern's Cliburn victory 11 years ago with a co-presentation of her talents in March and April of 2011. Also in 2011, Kern performed with the symphonies of Detroit, Anchorage, Nashville, Dallas, Virginia, St. Louis, Rochester, Pittsburgh, Madison, Johnson City, Syracuse and Colorado. Additionally in North America, she has been invited to perform at Longwood Gardens, the Sanibel Music Festival, the Winter Park Bach Festival, the Royal Conservatory of Music in Toronto, and Drake University. Ms. Kern records exclusively with Harmonia Mundi, and her Chopin Sonatas CD was released in 2010. Cellist David Finckel's multifaceted career as concert performer, recording artist, educator, arts administrator, and cultural entrepreneur places him in the ranks of today's most influential classical musicians. His concert appearances as orchestral soloist, duo recitalist with pianist Wu Han, and cellist of the Grammy Award-winning Emerson String Quartet, take him to the world's most prestigious concert series and festivals. David Finckel's wide-ranging musical activities also include the launch of ArtistLed, classical music's first musician-directed, Internet-based recording company. David Finckel and Wu Han serve as Artistic Directors of The Chamber Music Society of Lincoln Center. They are also the founders and Artistic Directors of Music@Menlo, a chamber music festival in the San Francisco Bay Area. Spivakov and Kern's U.S. concerts are presented by Maestro Artist Management (MAM), a full-service production, touring and promotion company that focuses on presenting international artists in a variety of genres, from classical music and dance to theatre and world music, to audiences in the U.S. For more information about this tour and upcoming performances, visit www.maestroartist.com. Also, Tuba Concerto. Heather Harper, soprano; John Fletcher, tuba; Andre Previn, London Symphony Orchestra. HDTT HDCD244. 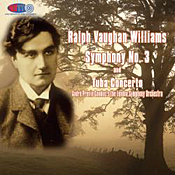 When English composer Ralph Vaughan Williams (1872-1958) completed his third symphony in 1922, he called it the "Pastoral Symphony," numbering it some years later. The name conjures up visions of green English countrysides, perhaps rolling hills and sweet zephyrs blowing through the trees, a veritable wind in the willows. However, that wasn't the composer's intention. He planned the symphony in 1916 while serving in Northern France during World War I. He intended the music as an elegy for the fallen soldiers of a senseless war and as a meditation on peace. Of the many recordings made over the years of this essentially enigmatic piece of music, my favorites have long been those of Sir Adrian Boult (EMI) and the one we have here from Andre Previn (RCA), now remastered by HDTT (High Definition Tape Transfers). Previn and the LSO bring out all the beauty and restrained power of the work in a performance of grace and polish. It helps, too, that the remastering makes it sound better than ever. The symphony's first movement is wonderfully bucolic, Previn rendering those French fields with the utmost serenity and distinction. The music tends to ripple along rather like the work of several other English pastoral composers--Arnold Bax or Frederick Delius, for instance. Vaughan Williams remarked that he did not mean for the movement (or the symphony) to be programmatic, yet one cannot help picturing wooded hillsides and flowing streams in this segment. It may not be the most-exciting music in the world, but it is wonderfully relaxing. Although the second, "slow" movement is hardly much slower than the movement that precedes it, it does maintain a more low-key mood, especially the way Previn coaxes the notes out. The trumpet cadenza, another reflection of the War and its devastation, never sounded more persuasive. Following that, we get what passes for a scherzo, which typically ought to be a relatively short, fast, light, often playful movement, but which here the composer makes rather dark, Previn taking him at his word. It is marginally the quickest and most dynamic music in the symphony and has a surging onward pulse, even if by the time it's over the tone has returned to that of the symphony's opening moments. The final movement, marked Lento (slow), is the most creative and atmospheric section of the piece, with Previn underplaying it just enough to make it, with its wordless soprano melody (sung here by Heather Harper), hauntingly fascinating. This is not a big symphony in the conventional sense but music for quiet contemplation. As such, the "Pastoral Symphony" has never been among Vaughan Williams's most popular works (it may just put some listeners to sleep), but it is one of his loveliest and most thoughtful. Accompanying the symphony we find the Tuba Concerto in F minor from 1954. It is short and sweet, or as sweet as a tuba can sound, and Previn ensures that the three movements bounce (or galumph) along in good spirits. The music stands in contrast to the nature of the "Pastoral Symphony" that precedes it and, therefore, makes an attractive companion. Surprisingly, it is not at all as ungainly as one might expect, with tuba player John Fletcher making it appear quite fleet and graceful. RCA recorded the performances in 1972, and HDTT remastered them from an RCA vinyl LP (LSC-3281) in 2011. The sound is remarkably smooth and placid, like the music itself, flowing gently forward, yet with plenty of delicate detail and definition. This is not superspectacular, blockbuster sound; it is warm, natural, realistic sound, an orchestra in front of us in all its breadth and depth, if somewhat subdued. While there is some minor background noise on occasion, perhaps the result of a little judicious noise reduction, I don't know, it is slight. The orchestral imaging is, above all, what a listener will probably notice and remember most about the recording. Walter Susskind, St. Louis Symphony Orchestra. Mobile Fidelity UDSACD 4006. 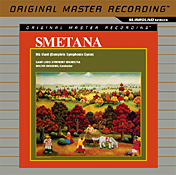 Originally issued by Vox/Turnabout in 1975, this performance by Walter Susskind of Bedrich Smetana's set of descriptive tone poems has remained a favorite recording of many listeners for over thirty-five years. It's nice to hear it so lovingly remastered by Mo-Fi. Smetana completed Ma Vlast, "My Country," in 1874 and dedicated it to the city of Prague. The work is, as most of you know, made up of six interrelated symphonic pictures, the first four, "Vysehrad," "Vltava" ("The Moldau"), "Sarka," and "From Bohemia's Woods and Fields," describing the sights and sounds of Smetana's native Czechoslovakia, while the last two, "Tabor" and "Blanik," celebrate famous military victories in Czech history. Incidentally, the composer requested that "Tabor" and "Blanik" never be played separately; that is, never without the other. Anyway, the complete cycle displays a varied number of moods and actions that have delighted audiences for as long as it's been around. Maestro Susskind's way with the work is elegant and refined, much as we might find a Marriner or a Mackerras approaching the score. Not that the interpretation lacks energy or excitement--it would be hard to deny the music its due, no matter who was conducting it--but it does seem to lack an essential intensity that several other favorite conductors demonstrate. 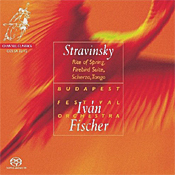 Among the recordings I compared are the totally committed one with Rafael Kubelik and the Czech Philharmonic on Supraphon, the involving account with Paavo Berglund and the Dresden State Orchestra on EMI Seraphim, the period-instruments version by Roger Norrington and the London Classical Players on Virgin, the stylish production with Vaclav Neumann and the Leipzig Gewandhaus on Berlin Classics, the winning rendition with Libor Pesek and the Royal Liverpool Philharmonic on Virgin, and the wholly involving interpretation with Antal Dorati and the Concertgebouw on Newton Classics. By comparison, Susskind seems a tad lax, content to let the music set its own course, certainly not a bad idea. In any case, Susskind is best in the surging currents of "The Moldau" and the sweeping hills and valleys of the "Bohemia" section. Then again, the two rather bombastic concluding poems have never impressed me as much, so Susskind may not be at fault for not offering them up in a more rousing manner. The sound, originally made, as I said, by Vox in the mid 70's, as remastered by Mobile Fidelity on this hybrid SACD issue is ultrasmooth, ultraclean, and uncommonly widespread, even on the stereo layer to which I listened, but by comparison again to the recordings mentioned above, it's also a tad too warm and soft. Interestingly, it's the Berglund and Dorati recordings I found sonically superior on my system (VMPS RM40s)--more detailed, transparent, and dynamic than the rest. And the Berglund, at budget price, is also the cheapest of the bunch I auditioned. But for those listeners who have always cherished the Susskind reading, it has undoubtedly never sounded so good. Also, The Water Goblin; In Nature's Realm. Zuill Bailey, cello; Jun Markl, Indianapolis Symphony Orchestra. Telarc TEL-32927-02. Mstislav Rostropovich, Yo-Yo Ma, Janos Starker, Maurice Gendron, Gregor Piatigorsky, Lynn Harrell, Pablo Casals, Paul Tortelier, Rafael Wallfisch, Pierre Fournier: There is a host of superstar cello players who have already recorded terrific performances of Dvorak's Cello Concerto. So, how does newcomer Zuill Bailey fare among the elite? Pretty well, actually. I had quite liked his Bach Cello Suites from a year or so earlier, and this new album is no less impressive. For many years, composers sort of shunned the cello, at least as a solo instrument with orchestral accompaniment, J.S. Bach, Mozart, Beethoven, Schubert, and the like pretty much ignoring it except in chamber works. Fortunately, by the late nineteenth century things picked up for the cello, and by the twentieth century it had taken a respectable place in the halls of classical music. Antonin Dvorak (1841-1904) wrote his Cello Concerto in B minor, Op. 104 in 1895, somewhat late in the composer's career, but it has since become one of the most-popular cello concertos of all time. There's no mistaking its late Romantic trappings, its abundance of melody, and its strong emotional involvement. These are the very qualities cellist Bailey, conductor Jun Markl, and the Indianapolis Symphony Orchestra bring out best in the work. Dvorak starts his concerto with an imposing orchestral introduction before the entrance of the cello, a preface that includes references to the work's two main themes to come. Markl accentuates the music without glamorizing it too much. Then, when Bailey enters, playing a 1693 Ex "Mischa Schneider" Matteo Gofritter cello, he ensures that listeners recognize all the rugged, mountainous power of the piece, while simultaneously bringing out its passionate, lilting sensitivity. It's an accomplished rendition. Moving on, under Bailey the music of the central Adagio flows gently along like a slow-moving stream, the performer making it sound as wistful as I've ever heard it. Perhaps the illness and eventual death of the composer's sister-in-law, with whom he had once been in love, contributed to this and the final segment of the concerto. Bailey communicates the emotive intensity of the movement well. Bailey and company guarantee the finale bristles with energy, ending appropriately enough with a touch of melancholy in the climactic love duet before the massive close. Overall, the performance hasn't quite the lyricism of Gendron's reading or the masculine boldness of Starker's interpretation, but it's close enough in both regards. Accompanying the Concerto are two of Dvorak's more-colorful tone poems. The Water Goblin he based on a rather grim little folk tale that might scare the pants off any child who heard it. Maestro Markl plays up its macabre aspects in high fashion. In Nature's Realm is a more forgiving work, a paean to the enduring and uplifting spirit of Nature. Here, Markl lets the music soar and closes the show in fine form. Telarc recorded the Concerto live in concert at the Hilbert Circle Theatre, Indianapolis, Indiana, in February of 2011. It's something of a departure for Telarc, recording live; at least, I can't recall their doing many or any live recordings before, although my memory probably fails me. In any case, how they got the audience to remain as quiet as they are is anybody's guess, since the miking is not particularly close up, except on the cello. The sound turns out to be typical of Telarc's previous work in that it's wide, full, and lightly reverberant. It's just a tad heavy, yet it reveals good inner detail and splendid clarity. The orchestra also displays plenty of depth, with good imaging all the way around. Although I wish the cello weren't quite so prominently placed up front, it's a minor concern in a most rewarding presentation. Two issues I did have, though: (1) The album cover (shown above) looks fairly unattractive, the name "Dvorak" in blue against a dark background rendering it hard to read; and (2) the unfortunate burst of applause after the Concerto almost completely took me out of the mood the performers had so carefully built up for over half an hour. I hope Telarc's art design and their decision to record live are only temporary aberrations. Eric Reed, horn; Christopher Coletti and Brandon Ridenour, trumpets; Achilles Liarmakopoulos, trombone; Chuck Daellenbach, tuba. Steinway & Sons 30008. The folks who comprise Canadian Brass have been tootling their horns for over four decades now, and audiences never seem to tire of their enthusiastic and virtuosic musicianship. Of course, the membership changes from time to time, with the current five players being Eric Reed on horn, Christopher Coletti and Brandon Ridenour on trumpets, Achilles Liarmakopoulos on trombone, and Chuck Daellenbach on tuba. No matter the makeup of the group, however, they always appear to have been performing together forever, they sound so well integrated. 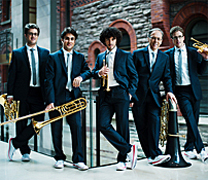 This time out on Canadian Brass Takes Flight they perform a motley assortment of tunes that apparently not even they can adequately explain. It doesn't hurt the music, but it does complicate it. 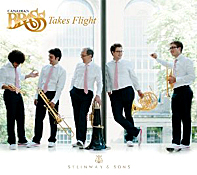 For instance, on the back cover their publicist writes, "Canadian Brass truly takes flight with this new album--their premiere release on Steinway & Sons." Fair enough, given that the lead number is Rimsky-Korsakov's Flight of the Bumblebee and another is Bach's Air on the G String. But how to explain the inclusion of Kompanek's Killer Tango or Mozart's Turkish Rondo? Inside the Digipak we read, "Canadian Brass Takes Flight is a kind of 'state of the union' address, as the group's current membership revisits and refreshes examples of its unique contribution to the brass quintet universe--four decades of performing, four centuries of music." Again, fair enough. Maybe they mean the current disc to be a sort of greatest hits album, newly recorded. If so, there is little rhyme nor reason for the selections except that somebody liked them. In any case, it's the music that counts, and the music is splendid, despite the sometimes jarring juxtapositions of the tunes. We get eighteen tracks that range from classical (Bach, Brahms, Mozart, Rimsky-Korsakov) to tangos to gospel to Dixieland jazz. Whatever the music, you can count on Canadian Brass to perform it in a lively, sprightly fashion, with the utmost precision along the way. Personally, I enjoyed the several Bach selections best of all, along with the tangos. Things get a little static by the middle of the program, unless you are a devoted brass afficionado, but they pick up with Bach's Air. The album closes with three numbers in New Orleans jazz style, the group's usual opening number, Just a Closer Walk with Thee, here closing the show. While it's a mixed bag, as I say, it's undeniably fun. Canadian Brass's new label is Steinway & Sons (or it's their co-label as this is a little confusing, too. The Digipak lists the recording as a cooperative project among Steinway & Sons, ArkivMusic, and Opening Day Entertainment Group, with the financial support of the department of Canadian Heritage, Canada Music Fund, and Canada's Private Radio Broadcasters). Whoever produced the album engineered it well, recording the group at Christ Church, Deer Park, Toronto, Canada, in August of 2011. The sound they obtain is full and resonant, a mellow acoustic to match the richness of the instruments, with a pleasant sense of occasion in the ambient environment. The sonics are ultrasmooth, or as smooth as brass instruments can be. One can discern each of the five instruments clearly, spread out convincingly across the stage, miked at an ideal distance for easy listening. The Music Institute of Chicago offers its students the opportunity to participate in—and the public the opportunity to observe—master classes with esteemed musician Menahem Pressler February 17 and 18 at Nichols Concert Hall, 1490 Chicago Avenue, Evanston. Trio Fantastico—violinist Zachary Brandon, cellist Annamarie Wellems, pianist Kyle Jannak-Huang: Beethoven's Piano Trio in D Major, Op. 70, No. 1 "Ghost"
The February 18 program features solo pianists and chamber musicians who study in the Music Institute's Community School; auditions will take place later in January. 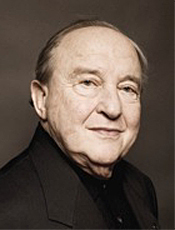 Menahem Pressler, founding member and pianist of the Beaux Arts Trio (described by the Washington Post as "the gold standard for trios throughout the world"), has established himself among the world's most distinguished and honored musicians, with a career that spans more than five decades. Now in his 87th year, he continues to captivate audiences throughout the world as performer and pedagogue, performing solo and chamber music recitals to great critical acclaim while maintaining a dedicated and robust teaching career. For nearly 60 years, Pressler has taught on the piano faculty at the world-renowned Indiana University Jacobs School of Music, where he currently is Distinguished Professor of Music as the Charles Webb Chair. The Music Institute of Chicago believes that music has the power to sustain and nourish the human spirit; therefore, its mission is to provide the foundation for lifelong engagement with music. The Music Institute offers lessons, classes, and programs through four distinct areas: the Community School, Academy, Creative Arts Therapy (Institute for Therapy through the Arts), and Nichols Concert Hall, an education and performance center in downtown Evanston that reaches approximately 14,000 people each year. As one of the three largest and most respected community music schools in the nation, the Music Institute offers musical excellence built on the strength of its distinguished faculty, commitment to quality, and breadth of programs and services. Founded in 1931 and one of the oldest community music schools in Illinois, the Music Institute is a member of the National Guild of Community Schools of the Arts and accredited by the National Association of Schools of Music. Each year, the Music Institute's world-class music teachers and arts therapists provide the highest quality arts education to more than 5,000 students of all ability levels, from birth to 101 years of age. With nearly 50 piano faculty serving more than 750 piano students, the Music Institute's piano department is its largest. The school also has a thriving chamber music program with more than 40 chamber groups that rehearse weekly with Music Institute coaches. The Music Institute of Chicago includes campuses in Evanston, Highland Park, Lake Forest, Lincolnshire, Winnetka, and Downers Grove. The Music Institute also offers lessons at the Steinway of Chicago store in Northbrook and early childhood Musikgarten® classes and community engagement programs throughout the Chicago area and the North Shore. The Music Institute's community engagement and partnership programs reach an additional 6,500 Chicago Public School students annually. Founded in 2006, the Music Institute of Chicago Academy has established itself as one of the most respected pre-collegiate conservatory programs in the United States. The Academy's internationally recognized faculty, rigorous curriculum, and instructional model, as well as the program's highly gifted students, have solidified its preeminent reputation. Students in this prestigious program have come from throughout the United States, as well as from Central and South America, Europe, Japan, China, and Korea. The very selective program focuses on providing an intensive and comprehensive musical education and significant performance opportunities for developing musicians. The carefully assembled faculty represents teachers and performers with a passion for developing young talent and an established reputation for student achievement. The master classes with Menahem Pressler take place Friday, February 17, 7–9:30 p.m. and Saturday, February 18, 10 a.m.–12:30 p.m. at Nichols Concert Hall, 1490 Chicago Avenue, Evanston. General admission is $10 at the door. For information, visit musicinst.org. Strathmore's Music in the Mansion series will begin 2012 with four performers from different genres--jazz from the Bruce Swaim Quartet, international folk by Jayme Stone, experimental new music from Imani Winds and classical cello performance by Clancy Newman. The Bruce Swaim Quartet will perform on Thursday, January 12, 2012 at 7:30 p.m.; banjoist Jayme Stone will debut his new album, Room of Wonders, on Friday, January 13, 2012 at 8 p.m.; Imani Winds will host a residency at Strathmore culminating in a concert on Thursday, January 26, 2012 at 7:30 p.m.; and Clancy Newman can be heard on Sunday, January 29, 2012 at 7:30 p.m. For more information or to purchase tickets, call (301) 581-5100 or visit www.strathmore.org. Thursday, January 12, 2012, 7:30 p.m.
Friday, January 13, 2012, 8:00 p.m.
Thursday, January 26, 2012, 7:30 p.m.
Sunday, January 29, 2012, 7:30 p.m.
For additional information or to purchase tickets visit www.strathmore.org or call (301) 581-5100. With stage direction that calls for camels, pyramids, armies, and lavish period costumes, Giuseppe Verdi's Aida has been a hit with audiences since its premiere in Cairo in 1871. It is nothing short of an event, then, that Sondra Radvanovsky--called the greatest Verdi soprano of this generation--will bow as the title character during Lyric Opera of Chicago's production from January 21 to February 8, 2012. Radvanovsky stars alongside tenor Marcello Giordani and mezzo-soprano Jill Grove. The opera centers around a tragic relationship between the captive Ethiopian princess Aida (Radvanovsky) and Radames (Giordani), captain of the Pharaoh's army. The war between their respective nations is made even more complicated by the jealous princess Amneris (Grove), who loves Radames. Before the curtain falls, high priests, Ethiopian kings, Egyptian society, and the Pharaoh will be embroiled in the complicated love affair. Renato Palumbo conducts, and the original production by Nicolas Joel is being remounted by stage director Matthew Lata. The sets and costumes are designed by Pet Halmen. Radvanovsky appears in the production January 21, 25, 28, 31, and February 3 and 8, 2012. On January 17, the three lead singers will join Lyric's dramaturg Roger Pines for an informal conversation as part of Lyric Opera of Chicago's Discovery Series. The Discovery Series allows fans to hear what the performers' thoughts and opinions on the composer's work are in a relaxed setting. Radvanovsky, Giordani, and Grove will all discuss Verdi's great work. Tickets are $16. Radvanovsky is excited to continue her 2011-12 season after a particularly successful role debut as the title character in Norma. Her appearance at Teatro Campoamor de Oviedo was met with rave reviews: Seen and Heard noted that Radvanovsky possesses "a rare mastery over her instrument which allows her to offer beautiful piano in her singing. Her 'Casta Diva' was one of many highlights"; the Spanish newspaper La Voz de Asturias wrote that Radvanovsky received the longest ovation of the season; and El Comcercio called her performance "exquisite." Although Radvanovsky tours the world performing in major opera houses including Royal Opera House-Covent Garden, Paris Opera, Teatro alla Scala, Vienna State Opera, San Francisco Opera, and numerous others, she was born just outside of Chicago. She is thrilled whenever she has a chance to perform in her home city. That the role of Aida demands a tremendous vocal range, power, and tenderness that few living sopranos possess makes this production all the more special. Radvanovsky's last appearance at Lyric was in Verdi's Un ballo in maschera. Of her performance, Chicago Classical Review raved, "Her gleaming top notes were thrilling in the ensuing love duet, and Radvanovsky's searing rendition of the showpiece, 'Morro, ma prima in grazia' was the highlight of the evening, beautiful sung and emotionally riveting." This fall, Radvanovsky had the honor of singing during the award ceremony in Stockholm, Sweden for the Birgit Nilsson Prize, at which Chicago Symphony music director Riccardo Muti was awarded a prize of one million dollars. After a successful 2010-11 season, which included her Metropolitan Opera debut as Tosca, her hosting of a Metropolitan Opera HD broadcast, and the release of a duets CD with Dmitri Hvorostovsky, Radvanovsky begins 2011-2012 by performing Verdi with the San Francisco Symphony (Requiem, met with a glowing review) and with the Prague Opera for their gala. She will also make her Toronto Symphony Orchestra debut and finishes her season in Cyrano de Bergerac at Teatro Real Madrid with Placido Domingo in the title role. Sondra Radvanovsky is a globally celebrated artist. The sincerity and intensity that she brings to the stage as one of the most prominent Verdian sopranos of her generation have won her accolades from critics and loyalty from passionate fans. When the Washington Post praised her singing as "outright gorgeous, poignant and silvery," it confirmed what Radvanovsky followers had known for years. On the concert platform, Radvanovsky has performed with the Boston Symphony Orchestra and the Verbier Festival Orchestra, both with James Levine, and with the Chicago Symphony with David Zinman. Last season saw a duet recital with Dmitri Hvorostovsky at Carnegie Hall and the Kennedy Center. Music Director Ludovic Morlot and Executive Director Simon Woods announce the appointment of Stilian Kirov as Seattle Symphony's Douglas F. King Assistant Conductor. In September, Kirov, who currently serves as a Conducting Fellow, will begin his new role as Assistant Conductor for the Orchestra's 2012–2013 season. He succeeds Eric Garcia, whose appointment as Assistant Conductor ends this June. "I had the chance to observe Stilian's work during his audition with the Seattle Symphony last season," Morlot commented. "I was quite impressed with his skills and abilities, and we were inspired to create a new position, Conducting Fellow, for him. This position provides great opportunities to work with my colleagues and me during his residency this year. Having seen him interact with Symphony musicians, I decided to appoint him to a full-time position as my Assistant Conductor next season. I am very excited to share his talent with our Orchestra and community." Kirov will conduct the Seattle Symphony for the first time in an open reading session on Tuesday, January 31, 2012, at Benaroya Hall when the Orchestra will read works by University of Washington student composers Abby Aresty, Yigit Kolat and Josh Archibald-Seiffer. As Assistant Conductor, Kirov's duties will include leading concerts — especially neighborhood, family and education concerts; covering rehearsals and performances; editing concert recordings for radio broadcast and grant support; and working with the artistic staff on programming ideas. Serving as assistant or associate conductor at a major orchestra is a key professional development opportunity for young conductors. Kirov's current Seattle Symphony conducting fellowship includes four weeks of cumulative mentorship by Morlot and guest conductors Andrew Manze and Jesús López-Cobos. Serving as cover conductor for performances on the Wyckoff Masterworks, Baroque & Wine, Gilman Discover Music and Beyond the Score series, he has had the opportunity to explore a wide variety of repertoire. Stilian Kirov's currently serves as Associate Conductor of the Memphis Symphony Orchestra and Music Director of the Memphis Youth Symphony Program. He previously served as Music Director and founder of the Art Symphony Orchestra in New York and has conducted major orchestras in France, Germany, Italy, Greece, the United States, and his native country, Bulgaria. He has been awarded numerous prizes and merits, including Third Prize and the Orchestra Preference Award at the 2010 Mitropoulos Conducting Competition, the Charles Schiff Conducting Award for outstanding achievement at The Juilliard School, 1st Distinction at the V Witold Lutoslawski International Contest for Young Conductors, and the Bruno Walter Memorial Scholarship. Kirov has been awarded France's 2010 Young Conducting Talent Prize by the ADAMI Association, culminating in a showcase concert at the Salle Gaveau (Paris) with the Orchestre Colonne in 2010. In 2011, he conducted the Orchestre Colonne's season-opening concert and made his debut at the Musical Olympus International Festival in St. Petersburg, Russia. He served as Assistant Conductor at the National Repertory Orchestra in 2009 and l'Orchestre de l'Opéra de Massy in France for the 2005-2006 season. He also worked as a cover conductor for Princeton Symphony in 2009-2010 and for a co-production between Opéra de Massy and Opéra National de Montpellier in 2005. Kirov has conducted major orchestras including the Memphis Symphony, Orchestre Colonne (France), Orchestra of Colors (Greece), State Hermitage Orchestra (Russia), New World Symphony, The Thüringen Philharmonic Orchestra (Germany), National Repertory Orchestra, Sofia Festival Orchestra, Philharmonic Chamber Orchestra "Leopolis" (Ukraine), The Juilliard Orchestra, The Lansing Symphony and others. Kirov graduated from the Orchestral Conducting Program of The Juilliard School, where he studied with Maestro James DePreist. 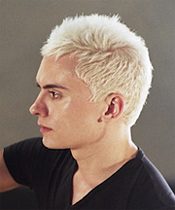 He also holds a master's degree from Ecole Normale de Musique de Paris, where his teacher was Dominique Rouits. Additionally, he has attended masterclasses with such distinguished conductors as Michael Tilson Thomas, Gianluigi Gelmetti, George Manahan and Asher Fisch. As a pianist, Kirov is a gold medalist of the "Claude Kahn" International Piano Competition in Paris (2001) and has worked with eminent conductors such as Maestro James Conlon, Roberto Abbado and James Levine. Also, Exsultate Jubilate. Helen Donath, soprano; Christa Ludwig, mezzo-soprano; Robert Tear, tenor; Robert Lloyd, bass. 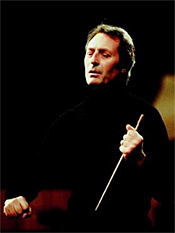 Carlo Maria Giulini, Philharmonia Orchestra and Chorus. EMI Seraphim Classics 7243 5 73702 2 6. 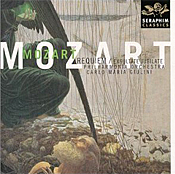 Wolfgang Amadeus Mozart's Requiem in D Minor, K. 626, seems to maintain a perennial hold on people's musical interests and appreciation; it remains endlessly popular, never seeming to go out of style. Maybe it's because it was the last thing Mozart composed before he died. Maybe it's because of a morbid attraction about his working on a funeral mass at his death. Maybe it's because he left it unfinished, and people have always been curious about what he might have done with it had he been able to complete it. Maybe it's because for years there was always a mystery about who commissioned it. Or maybe it's because it's just good music that almost everyone enjoys. Who knows. So, did Mozart divine his own death? Did he think he was writing his own funeral dirge? Or did a jealous rival, Antonio Salieri, secretly contract the work and then poison Mozart as the famous stage play and movie would have it? The reality is that a representative from a Count Franz von Walsegg surreptitiously commissioned the work, Walsegg wanting it to commemorate the recent death of his wife. The secrecy involved was because Walsegg was an amateur musician who sometimes passed off commissions as his own work. In any case, the truth isn't always as much fun as the legend. Fortunately, neither fact nor fable does anything to diminish Mozart's music. The classical catalogue overflows with as many different types of Mozart interpretations as you can name, from chamber orchestras to full orchestras, from period instruments groups to modern instruments ensembles, from regular singers and choirs to boy sopranos and all-male choirs. Maestro Carlo Maria Giulini takes about as old-fashioned an approach to the Requiem as possible, using a full, modern orchestra and traditional mixed soloists and full choir in his recording of the standard Sussmayr edition of the score. (Most critics believe that in failing health Mozart asked his assistant, Franz Xaver Sussmayr, to finish up the work in the event of his passing, which Sussmayr did.) Yet if Giulini's rendition is the kind you're looking for, he does it about as well as anyone around and better than most. Giulini lends the work his usual elegant, graceful touch, making the reading one of the smoothest, most refined, and most lyrical you'll find. Not that the performance is with its requisite energy and passion, however, as we hear in the Dies Irae and Domine Jesu movements. What's more, you won't hear a better team of soloists and choristers than the ones here, or a more-polished orchestral tone. That said, let me put in a caveat: I wouldn't necessarily count Giulini's realization as an absolute first-choice recommendation since I realize that a lot of listeners prefer an approach more in keeping with what Mozart might have heard in his own time, had he lived. Still, if it's a big production you're looking for, done by a full, modern orchestra (and at an uncommonly low price), you can hardly go wrong here. For many listeners, it may be exactly what they have always wanted. Add in the little Exsultate Jubilate, K. 165, with Erika Koth, soprano, and Berislav Klobucar leading the Berlin Philharmonic, and you get a better deal still. EMI originally recorded the Requiem in 1979, remastered it in 1998, and then reissued it on CD in 2000 and again more recently. It's hard to beat the Seraphim budget price, too, for a recording that still sounds respectable. Yes, it's a tad thin, and the upper midrange and high end can be a bit rough. Nevertheless, there is a good low-end response, a wide dynamic range, a strong impact, and at least adequate transparency. A broad stereo spread and a commendable stage depth complete a more-than-acceptable sonic picture. Peter Mattei, Camilla Tilling, Charlotte Hellekant, soloists; Paavo Jarvi, Estonian National Symphony Orchestra. Virgin Classics 7243 5 45722-2. 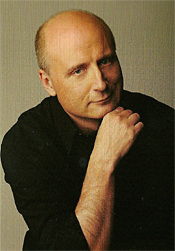 Of the recordings I've now heard by Paavo Jarvi, this one of Grieg's Peer Gynt finds him most at home. Indeed, it is one of the handful of finest performances of this music I have found, and it is a treat for the ears as well. People probably know Edvard Grieg (1843-1907) best for his incidental music to the Ibsen's play Peer Gynt as well as for the Piano Concerto, although my guess is that most listeners would be more familiar with one or the other of the Peer Gynt concert suites than with the complete incidental music. In any case, it is not the complete incidental music we get here, anyway; it's an abridged version, about sixty minutes, or two-thirds, of the original ninety minutes of music. If you want the complete score, you'll have to go elsewhere, to Dreier, perhaps, on Unicorn or to father Neeme Jarvi on DG. But for the listener who wants the best possible sound and is willing to give up a little something to have most of the music on one disc, this release should fit the bill. All of the most familiar pieces are here, from "The Hall of the Mountain King" through "The Death of Ase," "Morning Mood," "Arabian Dance," "Anitra's Dance," "Solveig's Song," to the closing "Solveig's Cradle Song," and many more, twenty of the twenty-six sections in all. The soloists--Peter Mattei, Camilla Tilling, and Charlotte Hellekant--are uniformly beautiful in execution and the two choirs--the Estonian Girls' Choir and the Estonian National Male Choir--are in equally top form. The music still doesn't seem all of a piece to me, but that is the nature of the score, accompaniment as it is to something else. Virgin's sound, recorded in the Estonia Concert Hall, Tallinn, Estonia, is mostly excellent, perhaps a touch forward and bright in spots and not as dimensional as I'd like it to be, but pretty well balanced all the way around. Bass is adequate without being overpowering; mids are natural except in the highest regions; and treble is light and airy. This is an outstanding set in almost every way. 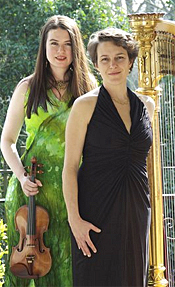 Lara St. John, violin; Marie-Pierre Langlamet, harp. Ancalagon ANC 139. In the accompanying booklet note to Bach Sonatas, Dr. James Seymour Helgeson writes at length about what is "authentic" or not about today's performing practices. One thing he points out is that composers like Bach would transcribe their own works for various other instruments, often to accommodate the players on any given occasion. 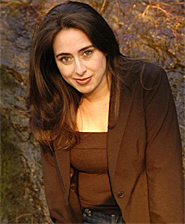 So it is not unusual that Canadian violinist Lara St. John would want to perform several of J.S. 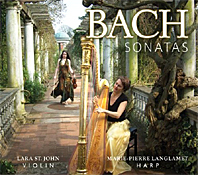 Bach's sonatas for violin and harpsichord in transcriptions for violin and harp. She has said that for these pieces she finds the harpsichord rather unsubtle in accompaniment and the modern piano heavy-handed. The harp, on the other hand, she feels better suits the spirit of the music. After listening to these unique, though not entirely inauthentic, transcriptions for violin and harp, I'd have to agree with her. Accompanying Ms. St. John is Marie-Pierre Langlamet, the principal harpist for the Berlin Philharmonic since Claudio Abbado appointed her to the post in 1993; together, they perform five sonatas Bach wrote (or scholars have ascribed to him) for violin and harpsichord or flute and harpsichord. So, in the last three sonatas Ms. St. John has replaced both flute and harpsichord with violin and harp. Fair enough. On the program Ms. St. John presents the sonatas in chronological order, starting with the Sonata No. 1 in B minor, BWV 1014, and continuing through the Sonata No 3 in E major, BWV 1016, the Sonata in G minor, BWV 1020, the Sonata in B minor, BWV 1030, and concluding with the Siciliana movement from the Sonata in E-flat major, BWV 1031. All of the works sound more delicate with harp accompaniment, lighter, airier, more diaphanous, more ethereal. Indeed, after hearing just the first sonata, I couldn't imagine wanting to hear it any other way. Still, it's the Sonata No. 3 that steals the show. It is particularly haunting, a little melancholy, and entirely enchanting, especially with the harp. Two of the four movements are adagios, ensuring a serene atmosphere, and the performers take the two allegros at a correspondingly relaxed pace so as not to disrupt the tranquil continuity of the piece. I'd recommend the album if this were the only selection on it, it's that good. The final three works on the disc Bach the elder may or may not have actually written, but it's close enough. Ms. St. John's and Ms. Langlamet's playing of the Sonata in G minor, originally for flute and harpsichord, has a graceful, almost playful quality to it. Then, we get the Sonata in B minor, also originally for flute and harpsichord, which is probably the most creative of the pieces on the album; it is quite a lot of fun, actually, with the performers appearing to have fun with it as well. The two musicians conclude the program with the Siciliana movement from the Sonata in E-flat, a perfect ending to the proceedings because of its sweet, gentle character. It's hard to argue against the amiably refined playing of Ms. St. John and Ms. Langlamet or their decision to perform together in the arrangements they do. The results are not just enchanting but sometimes stunning, turning familiar tunes into welcome new creations. Count the idea a success on my end. The folks at Ms. St. John's Ancalagon label recorded the performers at Teldex Studio Berlin in January, 2011. On the two-channel stereo layer of this hybrid 2.0/5.0 SACD, the sound is warm and full, with a pleasant ambient bloom on the instruments. The recording is slightly close-up but not so much that the performers are in our lap; it's just close enough to capture the crisp, vibrant tone of Ms. St. John's 1779 "Salabue" Guadagnini violin and the rich, mellifluent moods of the harp. In the first sonata I thought the resonance of the low harp strings was a tad too prominent, but the issue disappeared by the second selection. There is no forwardness to the sonics, no edge, no brightness, nothing to interfere with one's enjoyment of the music. And Other Courtly Arts. Rene Clemencic, Clemencic Consort; Paul Hillier, Theater of Voices; Andrew Lawrence-King, The Harp Consort; The Dufay Collective; Drew Minter, contre-tonor; Mary Springfels, The Newberry Consort. Harmonia Mundi Century HMX 2908166. Listening to this disc and reading the extensive booklet notes that go with it are a little like taking a history course. It's a bit overwhelming. Fortunately, if you just sit back and listen to the music, the album can provide quite a lot of enjoyment, too. The music here covers the Middle Ages; it's volume four of twenty compilation titles in the Harmonia Mundi "Century" series that also includes music of the Antique, Renaissance, Baroque, Classical, Romantic, and modern eras. The album reviewed here covers five areas of the Middle Ages. 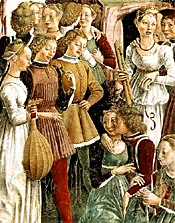 The first is the music of the troubadours of Southern France in the 11th and 12th centuries. 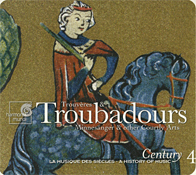 Troubadours were, as the booklet explains, the "first known representatives of lyric poetry which can be described as secular (that is, non religious) and more specifically as courtly." Today, we tend to think of troubadours as wandering minstrels or singers, but now we know they were more than that, at least in the beginning. Rene Clemencic and his Clemencic Consort, aided by soprano Pilar Figueras, perform three songs of the troubadours to start the program. While the tunes aren't exactly showstoppers, they do give us a feeling for the age, and the singing is splendid. The next section of the album covers "The art of the Trouveres," who sort of took up where the troubadours left off, this time in Northern France in the 12th and 13th centuries. Here we find seven song selections done by Andrew Lawrence-King and the Harp Consort, aided by the vocals of Stephen Harrold, Julian Podger, Ian Honeyman, Paul Hillier, and the Theatre of Voices. I found this selection of tunes somewhat hit-and-miss, but there is no denying the artistry involved. The third segment of the album was my favorite, the Cantigas de Santa Maria, canticles (poems or songs of praise) from Spain in the 13th century, mostly dedicated to the King of Castille, Alfonso X the Wise. Here, the Dufay Collective present primarily instrumental music, and it's lively and engaging, practically stealing the show. The next section of the program involves the music of the 13th, 14th, and 15th-century German minnesingers (singers of love songs). Again, we get more courtly songs of romance, performed by Mary Springfels and the Newberry Consort, with help from Drew Minter, David Douglass, and Kevin Mason. It's all quite lovely, actually, if a bit heavy. The program concludes with two selections from the Carmina Burana. No, not the one by Carl Orff; that came much later, with Orff finding his material in the original Carmina Burana of the 13th century, a manuscript discovered in the Bavarian monastery of Benediktbeuren. While I can't say I liked the music much, the Clemencic Consort, who opened the album, close it as well as one could expect. The sound, which comes from several previously released Harmonia Mundi recordings bearing publication dates between 2003 and 2005, is uniformly excellent. Whether the ensembles are relatively large or simply duets, the sonics treat them with clarity and cleanness, featuring a wide stereo spread when necessary and a wonderful sense of presence. The acoustics are often quite resonant, providing a pleasant and realistic ambient bloom on the music. Dynamics are strong and pointed, and midrange transparency is top notch without adding any brightness or edge in the process. When the sound needs depth, we get depth; when it needs a quick transient response, we get a quick transient response; and when voices need a natural accuracy, we get a natural accuracy. Very nice. The Venezuelan-American pianist Vanessa Perez "returns home" with a recording of Chopin's Preludes on Telarc, due for release May 8, 2012 in the U.S. and April 10, 2012 in Europe/UK. "The idea of recording all the Chopin Preludes came to me one night as I was playing them at home this past January," said Perez from her home in New Jersey. "Chopin brings me back to my childhood [in Venezuela]. It connects me to every possible emotion, and to so many memories. It is music I have always loved, and that reminds me how truly blessed I am to be a pianist." Perez debuted at age eleven playing Grieg's Piano Concerto with Orquesta Sinfonica Municipal under the direction of Carlos Riazuelo in Caracas; and was later awarded the Jose Felix Ribas Prize from the President of Venezuela in 1998, the highest honor for a young performer based on their contribution to the artistic enhancement of the country. Her studies began in Venezuela with Luminita Duca and then in the US with Claudio Arrau, Ena Bronstein, Daniel Epstein and Rosalina Sackstein. At the age of 17, she was awarded a full scholarship by the Royal Academy of Music (London) to study with Christopher Elton. Thereafter she continued her studies at the Italian Accademia Pianistica Incontri Col Maestro in Imola with pianists Lazar Berman, and Franco Scala and later completed postgraduate work at Yale University with Hungarian pianist Peter Frankl. Perez has performed frequently across the Americas and Europe, including at Puerto Rico's Casals Festival with the Orquesta de La Juventud Simon Bolivar and Conductor Diego Matheuz, in Germany with conductor John Axelrod and the Luzerner Sinfonie Orchester and in Caracas with the Orquesta de la Juventud Simon Bolivar and conductor Gustavo Dudamel in 2007. Recent concerto performances took place with conductor Ligia Amadio and the USP at the Sala Sao Paulo, Brazil, Carlos Riazuelo and the Sinfonica de la Juventud Simon Bolivar in Caracas, Rafael Gintoli in Buenos Aires, Enrique Batiz and the Orquesta del Estado de Mexico, and David Gimenez Carreras at the Palau de la Musica Catalana in Barcelona, Spain. In addition to her orchestral performances, she has given solo and chamber music recitals at the Wigmore Hall, London, Schnittke Festival at the RAM and the Montpellier Festival. Perez has recorded Beethoven's Piano Concerto No. 1 in C major with the Berlin Symphoniker, and Mozart's Piano Concerto No. 20 in D minor with Venezuelan conductor Eduardo Marturet and among her chamber music recordings, she was the pianist for Jan Vogler's "Tango" CD and the Moritzburg Ensemble released by Sony Classical in August 2008, and in 2009 collaborated with Joshua Bell and Bandoneon player Carel Kraayenhoff on Bell's recording "At Home With Friends." 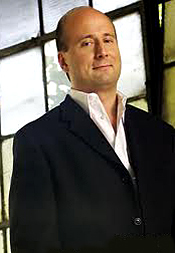 Pianist Brian Ganz began his "Extreme Chopin" quest to perform all of Frédéric Chopin's works in January 2010 at the Music Center at Strathmore. The soldout recital marked the start of Ganz's ambitious endeavor to perform the approximately 250 works of Chopin over the next decade. The next concert in the series will take place at Strathmore on February 11, 2012 at 8 p.m.
An audience of almost 2,000 attended the January 2011 concert, after which The Washington Post wrote: "Brian Ganz was masterly in his first installment of the complete works." Describing his Chopin as "often deeply beautiful," reviewer Robert Battey noted that Ganz "received several standing ovations. His strong identification with this repertoire yielded performances of warmth, affection and security." Ganz will explore the theme of "Dances and Fantasies" in his second Chopin recital at the Music Center at Strathmore. "The program will include such beloved Chopin favorites as the Fantaisie-Impromptu and the ever popular Polonaise in A Major," Ganz said. "The Polonaise-Fantaisie, Op. 61, one of Chopin's last large-scale masterworks for solo piano, will form the centerpiece of the program. It's one of Chopin's very personal statements, and relatively rarely heard." The complete program will include two Polonaises, Op. 40; No. 1 in A Major; No. 2 in C minor; Fantaisie ("Fantasy") in F minor, Op. 49; Impromptu No. 2 in F-sharp Major, Op. 36; Fantaisie-Impromptu in C-sharp minor, Op. 66 (Posthumous); Waltz in A-flat Major, Op. 42; Polonaise-Fantaisie, Op. 61; four Mazurkas, Op. 6; No. 1 in F-sharp minor; No. 2 in C-sharp minor; No. 3 in E Major; No. 4 in E-flat minor; and Andante Spianato et Grande Polonaise Brillante, Op. 22. Ganz is researching the question of whether every work has ever been performed before by a single pianist in a series. "Of course, the important thing is not whether I'm the first to do this. I'm excited to share works with Chopin lovers that they may never have heard before," Ganz said. "There are so many beloved works of great beauty and emotional power, but there are also quite a few buried treasures that deserve to be heard. It's fascinating to hear, for example, the different authentic versions that exist of some very well-known works. There are marvelous surprises in store for Chopin lovers." Ganz will perform Chopin's orchestral works with the National Philharmonic, led by Maestro Gajewski, who has embraced the pianist's ambitious endeavor wholeheartedly. "Brian is likely the first to undertake to perform all the works of Chopin. He is the perfect pianist to play all of Chopin's works--not only because of his great love for the composer, but also because of his intense connection with his audience," Gajewski said. "Brian's playing exudes incredible warmth and openness. He demonstrates an uncommon eagerness to bridge the distance between artist and audience." On numerous occasions, Ganz has brought his entire collection of Chopin's music to a performance so that he can accept requests from the audience. "One of my lifelong goals has been to study every single note Chopin composed," Ganz said. "This project gives me a lovely framework within which to reach that goal." In an exuberant review of a Ganz performance, The Washington Post wrote, "One comes away from a recital by pianist Brian Ganz not only exhilarated by the power of the performance but also moved by his search for artistic truth." In conjunction with his Chopin project, Ganz will sponsor an art contest for area students to increase their interest in classical music and, in particular, in Chopin. The theme of the contest will be "Extreme Chopin," and the winning artist's poster will be published and widely distributed to promote the 2012 concert. The winner will also receive $300. Entry rules at brianganz.com. Ganz is a graduate of the Peabody Conservatory of Music, where he studied with Leon Fleisher. Earlier teachers include Yida Novik and Claire Deene. Gifted as a teacher himself, Ganz is a member of the piano faculty and Artist-in-Residence at St. Mary's College of Maryland. He also serves on the piano faculty of the Peabody Conservatory. He has served on the jury of the Long Thibaud Competition in Paris. 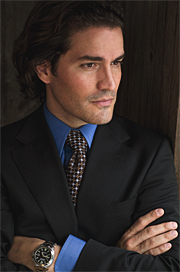 To purchase tickets to Brian Ganz's all-Chopin concert on February 11, 2012 at 8 p.m. at the Music Center at Strathmore, please visit nationalphilharmonic.org or call the Strathmore ticket office at (301) 581-5100. Tickets are $24 - $46; kids 7-17 are FREE through the ALL KIDS, ALL FREE, ALL THE TIME program (sponsored by The Gazette). ALL KIDS tickets must be purchased in person or by phone. Parking is free. Those who enjoy chamber music as well as those who want to learn more about this genre have an opportunity for in-depth understanding through the Music Institute of Chicago's "The World of Chamber Music," a music appreciation class for adults led by faculty member Stephanie Ettelson. The eight-week class runs February 9–March 29, 2012, Thursdays 2–4 p.m., at the Music Institute's Winnetka campus, 300 Green Bay Road. This class explores the richness and vibrancy of the chamber music repertoire, an intimate microcosm of symphonic style and form, with masterworks ranging from Haydn, Mozart, Beethoven, and Schubert to Mendelssohn, Brahms, Dvorak, Bartok, and Shostakovich. A discussion of recorded illustrations of various works enhances the participant's listening experience. There are no prerequisites and all are welcome to attend--novice and experienced concertgoer alike. Stephanie Ettelson has presented pre-concert lectures, classes, and workshops on symphonic and chamber music for more than four decades. As an orchestral and chamber music violinist, as well as an arts writer and former music critic, she brings a unique approach to "The Art of Listening" for the adult concertgoer. "The World of Chamber Music" runs February 9–March 29, 2012, Thursdays 2–4 p.m. at the Music Institute's Winnetka campus, 300 Green Bay Road. The cost is $190, $171 for seniors (60+). Students registered for classes at the Music Institute receive two free tickets to all MIC-sponsored events at Nichols Concert Hall. To register, call 847.905.1500, ext. 127 or visit "The Art of Listening" page on the Music Institute's website. Pianist Daniil Trifonov performs Tchaikovsky's Piano Concerto No. 1 in B-flat minor with the National Philharmonic, led by Music Director and Conductor Piotr Gajewski, on February 4, 2012, at 8 pm and on February 5, 2012, at 3 pm at the Music Center at Strathmore. Also on the all Tchaikovsky program are the Polonaise from Eugene Onegin, the Romeo and Juliet Overture-Fantasy and the 1812 Overture. The Tchaikovsky Competition triumph is the crowning achievement of a series of awards garnered by Trifonov, who in May won First Prize and Gold Medal at the 13th Arthur Rubinstein International Piano Master Competition in Tel Aviv and in 2010 won third prize in the 16th International Fryderyk Chopin Piano Competition in Warsaw. Held every four years in Moscow, the Tchaikovsky Competition includes the disciplines of piano, violin, cello and voice. In past years, the piano category has been won by such legends as Van Cliburn and Vladimir Ashkenazy. In Moscow in June, the International Tchaikovsky Competition awarded pianist Trifonov First Prize, a Gold Medal, the special prize for Best Performance of a Mozart Concerto and the Audience Choice Award. On the final day of the competition, he was selected as the Grand Prize winner. Born on March 5, 1991 in Nizhny Novgorod, Trifonov is a graduate of the Gnesin School of Music in Moscow, where he studied with Tatiana Zelikman. Since 2009, he has been studying with Sergei Babayan at the Cleveland Institute of Music. In 2008, he won first prize in the San Marino International Piano Competition and fifth prize in the International Scriabin Competition in Moscow. The concert begins with Tchaikovsky's Polonaise, an energetic dance from the composer's opera Eugene Onegin. Following, Trifonov will take the stage to perform Tchaikovsky's virtuosic Piano Concerto No. 1, one of the composer's most popular works. The program also includes Tchaikovsky's Romeo and Juliet Overture-Fantasy. The composer briefly considered composing an opera based on Romeo and Juliet, but instead, in 1880, completed it as an overture-fantasy, in which some of the themes represent specific character and plot developments of Shakespeare's iconic play. Last on the program is the 1812 Overture. Commissioned to compose the festive Overture to celebrate the 25th anniversary of Czar Alexander II's ascension to the throne, Tchaikovsky commemorated the clash between French and Russian military forces using folk songs, hymns and the national anthems of their countries. The overture is traditionally performed at July 4th celebrations. Maestro Gajewski is widely credited with building the National Philharmonic to its present status as one of the most respected ensembles of its kind in the region. The Washington Post recognizes him as an "immensely talented and insightful conductor," whose "standards, taste and sensitivity are impeccable." In addition to his appearances with the National Philharmonic, Maestro Gajewski is much in demand as a guest conductor. In recent years, he has appeared with most of the major orchestras in his native Poland, as well as the Royal Liverpool Philharmonic in England, the Karlovy Vary Symphony in the Czech Republic and numerous orchestras in the United States. Gajewski attended Carleton College and the University of Cincinnati, College-Conservatory of Music, where he earned a B.M. and M.M. in Orchestral Conducting. Upon completing his formal education, he continued refining his conducting skills at the 1983 Tanglewood Music Festival in Massachusetts, where he was awarded a Leonard Bernstein Conducting Fellowship. His teachers there included Leonard Bernstein, Seiji Ozawa, Andre Previn, Gunther Schuller, Gustav Meier and Maurice Abravanel. Gajewski is also a winner of many prizes and awards, among them a prize at New York's prestigious Leopold Stokowski Conducting Competition and, in 2006, Montgomery County's Comcast Excellence in the Arts and Humanities Achievement Award. The National Philharmonic is known for performances that are "powerful," impeccable" and "thrilling" (The Washington Post). The National Philharmonic boasts a long-standing tradition of reasonably priced tickets and free admission to all young people age 7-17, assuring its place as an accessible and enriching component in Montgomery County and the greater Washington, DC area. As the Music Center at Strathmore's ensemble-in-residence, the National Philharmonic showcases world-renowned guest artists in time-honored symphonic masterpieces conducted by Maestro Gajewski and monumental choral masterworks under National Philharmonic Chorale Artistic Director Stan Engebretson. The National Philharmonic also offers exceptional and unique education programs, such as the Summer Strings and Choral Institutes. Students accepted into the Summer String Institutes study privately with National Philharmonic musicians, participate in coached chamber music and play in an orchestra conducted by Maestro Gajewski. The Music Institute of Chicago has awarded fellowships to six extraordinarily gifted pre-college musicians in its Academy. These young talents have accomplished much already in terms of their performance histories and competition achievements. Gallia Kastner won the senior division of the 2011 Walgreens National Concerto Competition. Johannes Gray won the 2011 Crain-Maling Foundation Chicago Symphony Orchestra Youth Auditions and will perform with the CSO this spring. Alexandra Switala won the 2011 Sphinx Competition Junior Division. Kate Liu and Kelly Talim will perform with the Chicago Consortium of Community Music Schools in February. And on January 26, all six Academy Fellows will participate in the master class presented by the Chamber Music Society (CMS) of Lincoln Center at the Harris Theater. Also, Rachmaninov: Piano Concerto No. 2. Sa Chen, piano; Lawrence Foster, Orquestra Gulbenkian. PentaTone Classics PTC 5186 458. Despite the album listing the Grieg Concerto first on the cover and the spine, it is the Rachmaninov that begins the disc. Sergei Rachmaninov (1873-1943) premiered his Piano Concerto No. 2 in C minor, Op. 18, in 1901, after a bout of depression that only a hypnotherapist, Dr. Nikolai Dahl, could relieve. The composer thus dedicated the work to Dr. Dahl and went on to compose his Second and Third Symphonies, Third Piano Concerto, Paganini Rhapsody, Symphonic Dances, and a load of other popular stuff. Such is the power of persuasion. Chinese pianist Sa Chen takes the opening movement of the Rachmaninov, marked Moderato, in a most Romantic, lyrical manner, matching what most of us have come to expect from the composer's intentions. However, she doesn't try to impress the listener with any untoward heroics, while yet bringing out the virtuosic qualities of her playing. She seems to enjoy emphasizing the beauty of the Russian melodies, using perhaps a lighter touch than many of her colleagues in the work. In the central Adagio, Sa Chen appears a bit more leisurely than I've heard, which depending on your point of view either makes the music more appropriately lovely or just plain sluggish. I found her slower-than-usual tempo slightly obscured the primary melody's line, which sort of gets lost in the beauty of the notes. 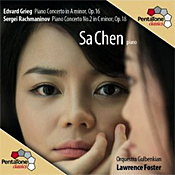 The big finale really sells the Concerto, of course, and Sa Chen shines brilliantly in it. It features one of the most popular and instantly recognizable themes in all classical music, and the pianist makes the most if it, with conductor Lawrence Foster and Lisbon's Gulbenkian Orchestra providing a fine, nonintrusive accompaniment. The pairing of the Piano Concerto in A minor, Op. 16, by Norwegian composer Edward Grieg (1843-1907) with the Rachmaninov is apt since many critics feel it was Grieg's work that inspired Rachmaninov. Anyway, Sa Chen takes much the same approach to this piece that she did in the Rachmaninov, bringing out the music's more lilting, more charming qualities at the expense of some of its brawnier aspects. At the risk of sounding sexist, it seems to me a gentler, more-feminine take on the Concerto than several other male pianists have recorded. Nonetheless, Sa Chen's interpretation is never without its own delights, not the least of which is her liquid-smooth delivery and polished, expressive tone. The sound, recorded in the Grande Auditorio of the Calouste Gulbenkian Foundation, Lisbon, in 2011, is warm and accommodating. Definition is a tad on the soft side, yet everything is easy and comforting on the ear without being flabby or dull. The recording nicely balances the piano with the orchestra, which we hear spread out broadly behind it. In the two-channel mode of this hybrid stereo/multichannel SACD to which I listened on a Sony SACD player, the dynamics sounded strong, sometimes even robust, with more than adequate bass and treble extension. While the PentaTone sonics may lack the ultimate transparency of several other recordings of this material (with LIM's remastering of Decca's 1973 recording of the Grieg with Radu Lupu, Andre Previn, and the London Symphony, you're in a whole other soundscape), they provide the advantage of a big, full, spacious, ambient aural presentation with luxuriant washes of sound, all of which goes a long way toward selling the music. Also, The Nightingale. Olga Trifonova, soprano; Robert Tear, tenor; et al. Robert Craft, London Symphony and Philharmonia Orchestra. Naxos 8.557501. 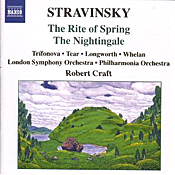 I didn't care overmuch for Maestro Robert Craft's conducting of Stravinsky's Firebird, issued by Naxos a few months earlier than this release, but I found his reading of The Rite of Spring more to my liking. Craft is a noted expert in things Stravinsky, having been a close friend of the composer and a co-conductor on occasion. Still, that doesn't mean we're all going to warm to his interpretations. While Craft seemed almost lackadaisical in his conducting of The Firebird, he seems positively energized in The Rite of Spring, if anything zipping through it at too hurried a clip. I compared his timing with several other conductors, Georg Solti and Colin Davis among them, and found Craft a full five minutes faster through a work usually lasting little more than thirty-five minutes. Nevertheless, the quick tempo adds a degree of tension to the music that is most exhilarating in places, and it does little harm to the basic story idea. This is not to say I would recommend Craft's recording above classic interpretations from Muti, Solti, Monteux, Boulez, Dutoit, Dorati, Davis, Rattle, Stravinsky himself, and others. Even more, I enjoyed the disc's coupling of Stravinsky's oft-neglected, complete one-act opera The Nightingale, although I am personally more keen on the music alone than on much of the rather static singing. Still, it's beautifully rendered by all concerned. The sound, recorded in 1995 with the LSO for The Rite of Spring and in 1997 with the Philharmonia for The Nightingale and reissued here, varies only slightly from one work to the next. The Rite seems cleaner and stronger to me, the Nightingale smoother and softer. In louder passages there is a touch of stridency in the higher notes, but it's nothing to worry about, really. The bass line in the Rite is strong if not particularly deep. As we have a master conductor at the helm of both these pieces, it's hard to argue the worth of this bargain-priced disc.